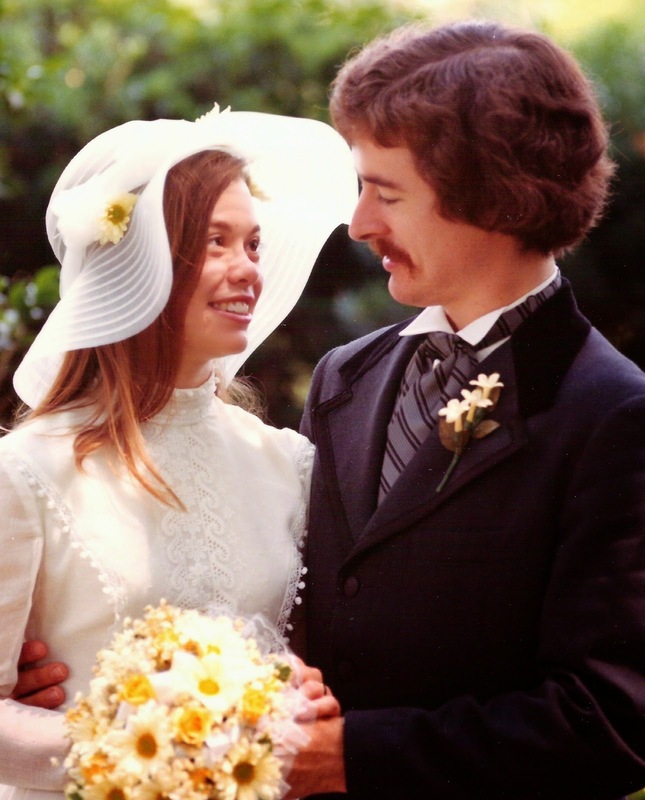 Love your wedding photo... Congrats on 40 years!!!! That's SO special. That area near Zion is such a beautiful area. We saw some of it (from the road) --and I always have had great memories of our time in that area. Sorry you got lost though --but glad you had some help getting back. Wow, what a challenge. Both the 50 mile ride and 40 years with mostly still liking each other. Love your wedding photo. Congrats! I can't imagine 50 miles of riding. I ride once a year at dude ranch type thing and its all I can do to do five. I loved the sportsmanship of the lady who helped you guys out. And I love the obvious care you take with your horses. I've never heard of a heart rate monitor for a horse but I can see where it would come in handy. Wow, congratulations both on your 40th anniversary and on the 50 mile finish!! That's a great placing with so many experienced riders and getting lost too. Very impressive!! Happy Anniversary! Your wedding picture is marvelous. Congratulations on both your 40 years together and your 50 mile ride. Congratulations on your anniversary. We are one year behind you and will not be celebrating with a 50 mile horse race! I would love to see that area though. Janie, you look like a child bride ;-) Brides seem so much older these days than in the 70s. I wonder how you would've placed if you hadn't taken a wrong turn. Top 25th percent at least, huh? Pretty cool. And nice wedding picture, so cute. Congrats on your 40th and thanks for sharing the wedding photo. Glad your angel came along for the help-out and you enjoyed your ride. Congratulations on surviving 50 miles and 40 years! Happy Anniversary! Glad you met your goal and handily too. Congratulations, Janie and Steve - both on the anniversary and on the ride! That's a long way to travel (on both counts!). PS Will you take offense if I say I love the "old" photo? What a sweet wedding photo - congratulations on your Ruby anniversary and many congratulations on your 50 mile ride - WOW!! Oh, my stars. You two are just adorable! Such love in your faces. Congratulations on your 40th -- and your ride! May you have many many more! What a beautiful bride you were and Steve so handsome. congratulations on finishing your ride. What a good idea to monitor the horses pulse. Congratulations on your 40th! What a happy milestone! Love seeing pictures of your rides. woohoo! I'm so happy for you 2! And Boss and Coco! And on your anniversary too! whoop whoop! Belated anniversary wishes to you! :D Sweet wedding photo! That was quite some ride, and how generous of Angie to stay with you and get you back on the right trail. Congratulations on finishing and doing so well! WOW. What a feel good post you've shared. Love that you all made it through this endurance ride with a smile on your faces. Wait, you were smiling, right??? What a great thing to do while celebrating 40 years...and mostly liking each other is a great thing. HA HA. Love the photo of you as 'children'. Happy anniversary!